Staff photo by John Rawlston/Chattanooga Times Free Press - May 20, 2015 Chattanooga Mayor Andy Berke speaks to members of the Chattanooga Times Free Press editorial board Wednesday, May 20, 2015, in Chattanooga, Tenn.
Chattanooga Mayor Andy Berke says he's flattered that Tennessee Senate Democrats think he'd make a great governor, but he's strictly focused on running the Scenic City. Last week, Senate Minority Leader Lee Harris, D-Memphis, and Sen. Jeff Yarbro, D-Nashville, said Berke was on a short list of Democratic mayors in the state who could appeal to a statewide electorate when Gov. Bill Haslam leaves office in 2018. Berke said Wednesday that campaigning isn't on his radar. "It's always very flattering when someone says a nice thing about you. 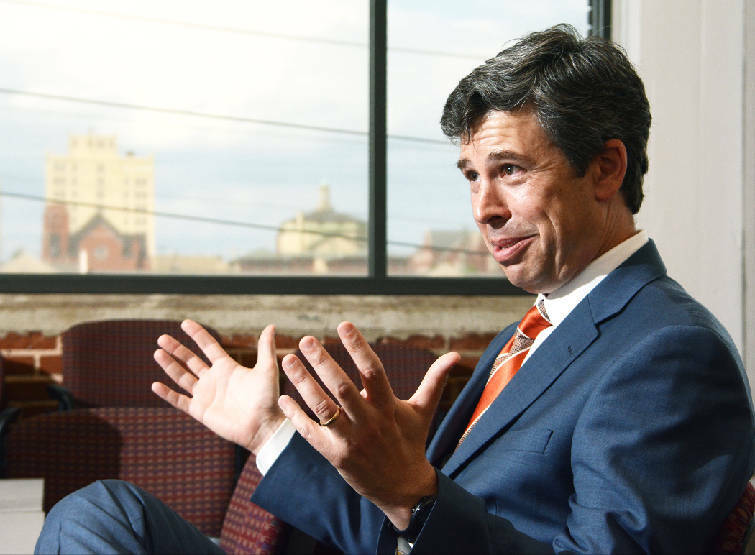 That being said, I wake up every day to better help the people of Chattanooga," Berke said. He said he's got no exploratory committee or plans for the governor's seat — and he's not even preparing yet for a second term as mayor. His term ends in 2017. "I'm just trying to do the job that I was elected to do for Chattanooga," he said. Berke's local campaign finance records show he hasn't raised any money from January 2014 to July 15 this year. But he has spent $43,200 with Global Strategy Group, a New York-based polling, marketing and public relations firm with offices in Washington, D.C., Hartford, Conn., Denver and Los Angeles. Berke said his "campaign conducts various activities" but did not divulge what services the payments bought. He added, however, that the Berke for Mayor campaign has no paid staff nor any full-time activity. Vanderbilt political science professor Bruce Oppenheimer says there's merit in what Yarbro and Harris suggest. Recent history shows successful metro mayors in Tennessee have been the picks for the governor's mansion and have won statewide races. Former Democratic Gov. Phil Bredesen was mayor of Nashville before taking the state's top seat. And Republican Gov. Bill Haslam was previously mayor of Knoxville. U.S. Sen. Bob Corker, a Republican, served as Chattanooga's mayor before he was elected to the Senate. "It's been the road to political success in this state for the past couple of years. It's certainly been the stepping-stone to being elected statewide," Oppenheimer said. With few statewide offices in Tennessee, mayors start out with large constituencies, he said. State Republicans say the state's too conservative for a Democrat to be elected statewide, but Oppenheimer is not so sure. "Yes, there is a good Republican lean to the state currently, but Bredesen was elected twice — handily — by the state," he said. And, if Republicans select an ultraconservative candidate for the governor's mansion, moderates and swing voters may go for a Democrat in the general election. Also, Republicans and Democrats have traded the job in two-term stints since former Republican Gov. Lamar Alexander held the post from 1979 to 1987. Alexander is now Tennessee's senior U.S. senator. Democrat Ned McWherter held the job for two terms after him, followed by two-term Republican Gov. Don Sundquist. Bredesen and Haslam followed. And before the two-term trend, the Democrat-to-GOP governor swap started with Republican Gov. Winfield Dunn in 1971. Dunn was the first GOP candidate to hold the seat since the 1920s. After Dunn, Democrat Ray Blanton held the seat four years starting in 1975 before Alexander won the post. But Oppenheimer warned not to put too much stock in historic patterns. "I think the politics have changed, clearly, since 1994. It's been much more difficult for a Democrat to win a statewide term here, with Bredesen being the only one," Oppenheimer said. "But governor races are different from U.S. Senate races. The quality of the candidate matters. A lot depends on who the parties choose as nominees."